The focus of my blog is to review book series and not individual novels, but writers are going to continue writing novels within a series even after I have done my review, so I plan on reviewing the individual novels as they come into circulation. 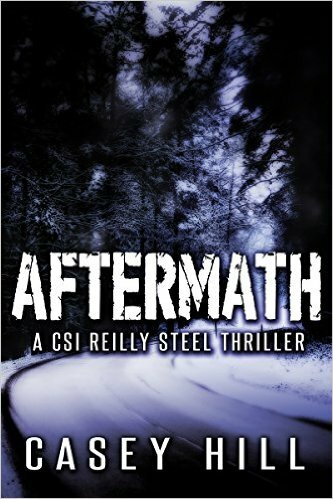 Casey Hill has just recently added book #6, Aftermath, to the Reilly Steel series. In my previous review of the Reilly Steel series, I have pointed out that the series has a running theme in that the murderers have an unusual mode of operation in the manner to which they murder their victims, which is unique to this series. However, in Aftermath the Hills have taken a different approach with a typical ‘whodunit’ scenario of an attempted murder of a well-known Irish athlete who also happens to be married to an equally famous newscaster wife. The celebrity couple is extremely loved in Ireland and so the investigation is closely overshadowed by the media which quickly becomes a thorn in the side of Reilly Steel and her fellow investigators. For those of you that have been following the series, Steel is dealing with a delicate condition which was revealed at the end of the previous novel, Trace, and much of the plot of Aftermath revolves around Steel’s ability to deal with the consequences. Because Steel is dealing with a new situation that she is totally unprepared for, she is pretty cranky throughout most of the story. That being said, I like this new Reilly Steel, she is more human instead of the golden girl that the Hills made her out to be in the beginning of the series. For you CSI buffs out there, the forensics in Aftermath are pretty much the standard fare, such as fingerprint and DNA analysis with some computer forensic thrown in as well. Not only is the forensic rather ho-hum, but the murder investigation is as well. I almost get the sense that the focus of Aftermath isn’t about the murder investigation but the development into Reilly Steel’s new life. This is fine for those that are following the series, but maybe a bit of a bummer for anyone trying to read this as a standalone, so my advice would be to read The Watched and Trace before reading Aftermath. For followers of the series, this should be a reasonably enjoyable read. Personally, I do hope that the Hills go back to the running theme of the complex and unusual murder investigations that they have done so well in their previous works. To learn more about the series check out a review of the Reilly Steel Series. Posted in Crime Thriller, Forensic Thriller.Tagged Book Review, Book Review Blog, books, Casey Hill, Crime Thriller, Forensic Thriller, reilly steel, Thriller.